A colony of rare plants, unique to Northumberland, has been saved by a transplant operation. Alchemilla micans, also known as shining lady's-mantle, was at risk from the expansion of quarrying activity near Humshaugh. It was moved to a specially-prepared area nearby, where it is now thriving. 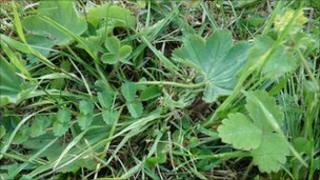 The plant, found in the UK only in Northumberland, is a little-known cousin of the popular Alchemilla mollis or lady's-mantle grown in many gardens. The rarer plant grows in the shallow soils overlying the Whin Sill, an underground solidified lava flow which has become exposed in some parts of the North East. It derives its name from alchemists during the Middle Ages who would use the pure dew from its leaves in experiments. The medieval herbalists also used this dew for treating wounds, and in the course of time the plant became Christianised and was named "Our Lady's Mantle". Natural England and the quarry company were responsible for moving the colony. Tony Laws, from Natural England, said: "Of course, it's always better to conserve important habitats and species in situ rather than try and move them to a new site, and this was very much a one-off operation. "Translocation of species and habitats is a last resort, but in this case there was little alternative. "We are relieved that the strategy has been successful so far and that these very rare plants are colonising the new site."